Finding food was difficult, and she admits she sometimes resorted to eating from the trash and panhandling to survive. “I would go to the park and wait until someone threw something away, then I would finish it,” she says. When someone stopped to give her money one day, they also gave her some valuable information about the city’s soup kitchens. Soon she made her first visit to Holy Apostles. Fortunately, Lilli eventually moved off the streets and into a nearby homeless shelter. A program connected to the shelter helped her find a job washing dishes, where she began to develop an interest in the culinary world, specifically in chocolate-making. With financial support from an employment preparation program she was able to take a chocolate class, using MetroCards from Holy Apostles for travel between the class and the shelter. She also relied on our computer lab to search for jobs online, develop her resume, and print copies for applications. Eventually her hard work paid off when she landed a part-time position training with a professional chocolatier. Lilli is currently enjoying her experience working and studying at the chocolate shop, and has ambitious plans for the future. She hopes to find another part-time job soon to have health insurance, and to save up enough money to move out of the shelter and into an apartment. She also has dreams of using her chocolate education to eventually open her own business, maybe a cart or a stand at the farmers’ market. volunteer positions in the social services program at Holy Apostles. 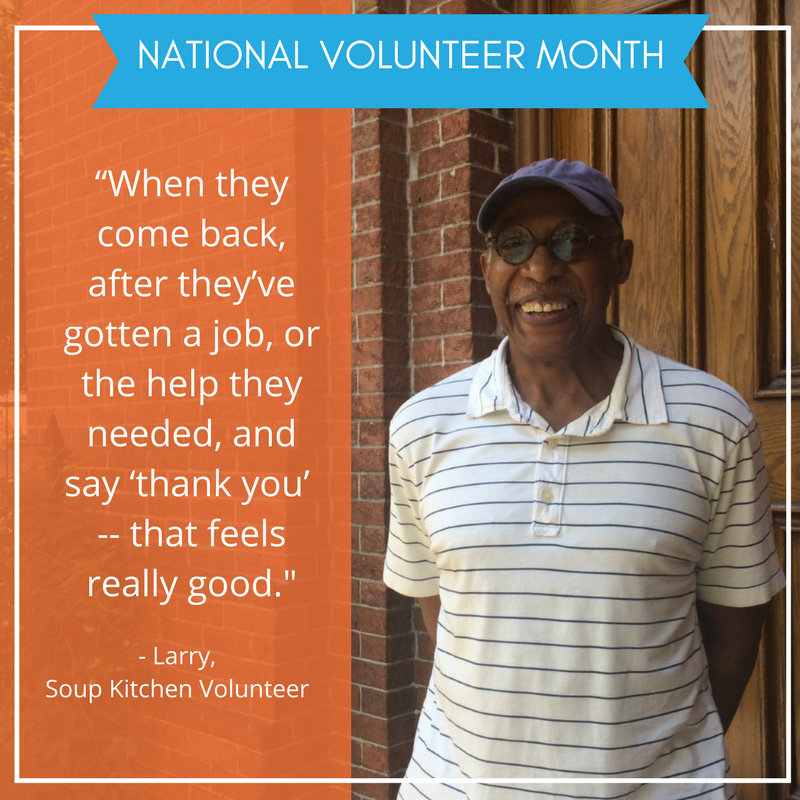 “I had always wanted to volunteer at a soup kitchen, so I gave it a try,” Larry recalls about his first day here in 2014. With the support of other volunteers and staff, Larry caught on quickly to the job of meeting one-to-one with our guests, listening and counseling them about their options for health, housing, employment resources and benefits. 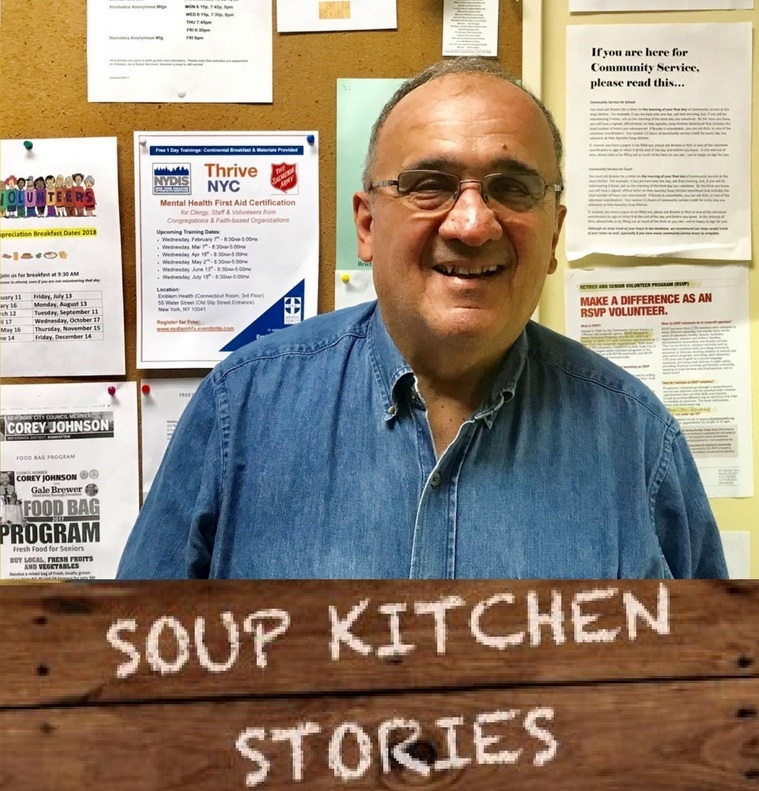 Since those first few days, Larry has been part of the life of the soup kitchen more than he could ever have imagined. In 2015 he signed on as one of our computer lab teachers, and he has been an avid fundraiser for our annual Fast-A-thon. The 70-year-old long distance runner isn’t new to marathons and giving his all to whatever he’s involved in. Let me take it anywhere, over the lamp, the sofa, my toy box. For not giving me that blueberry raisin cookie last Monday night! But then, I’d have to get a new mom. With his twice weekly volunteer service on the extra-bread line, it’s clear how much dedication Joe gives to every pursuit. The team of regular volunteers, he says, “is a well-oiled machine,” and he has a good time with others who share his commitment, and who he has developed friendships with. We’re thankful for the light Joe continues to shine on our Holy Apostles Soup Kitchen community! There once was a young peasant named Terragon who was but a humble laborer. He toiled in the muck in Earthland to the Lord of the region. Terragon looked up at the towering castle of stone in the daylight. Inside he visualized the Lord of the region drinking dry martinis from a golden chalice laden with jewelstones, streaming pay per view movies on his looking glass, eating leg of ham and turkey bits. He cracked a large whip. That night Terragon fell sleepwards in his thatched-roof cottage. Just as he was on the precipice of a pleasant night-dream, forgetting his woes, a specter manifested in an internal flash. Terragon leapt up in fright. “Hello?” he said, cautiously eyeing the phantasm who appeared surrounded in ectoplasm flame with a leather v-shaped headpiece, red horns, and cape black on the outside and red within. Terragon pondered dreaming of his own castle and princess. He did not want to toil in the field tomorrow, and didn’t know if he could bear another week or year of toilage. In the end Terragon accepted. A scroll appeared from black smoke and a quill, and Asmodel drafted the contract. I hereby make this bing covenant to take out a student loan. Terragon took a needle from the nightstand and poked his pinky finger several times. Finally, several drops of blood spilled out and he was able to sign. Terragon was informed that the Full Moon, not this Full Moon but the next Full Moon, he would receive the first disbursement of his student loan, which came in four disbursements. Afterwards, Asmodel departed theatrically by fire and cape. Terragon decided the next morning to depart seeing as how he now had a student loan. He was free to seek his own destiny, and it would be prudent to escape the foreman and other serfs, and start from the beginning in some other realm. He gathered his things, a few crusts of dry bread, some scrips and scraps, half of a potato, and his lucky rock and journeyed into the wide open Earthland. Terragon traveled the countryside until two Full Moons had passed. Inexplicably there was no sign of gold nor of Asmodel. He decided to visit an augur at the edge of the grove to see if he could contact Asmodel about the first disbursement. “I have been expecting you,” cried an old, withered crone from the inside of a hut surrounded by chimes, and talismans, and fetishes. Terragon travelled the countryside until he came to a large valley. Light seemed to loom over it forever. An ancient man sat in a rock. Terragon looked at the man who seemed to be staring into space absently. “Morning, sir,” said Terragon with a cheerful tone. The man continued gazing. This was a peculiar sight to Terragon, who had not done much travelling and had little knowledge of customs different from those of his small village. The old man looked up, a glaze in his eyes. He draped a tattered, colorless canvas throw around his shoulders. His skin was covered in soot and his grey mouth opened to reveal he had no teeth. “Strange, it seems I have forgotten what I was waiting for.” The remaining strands of wispy, white hair whipped about his head. He leveled a bony finger and pointed to a vast expanse of sand beneath a tempestuous black storm. Millions of tickets fluttered the landscape each bearing a meaningless symbol in an ancient language. Lightning crackled in the distance and the wind made a sucking, howling sound. Terragon had no I.D. and so crossed the desert alone. He travelled many weeks, suffering many hardships which I will not relate in details as they are of little interest. At last he came to an abandoned circus. A large Ferris Wheel spun slowly and there were the rusty faces of clowns on shooting gallery games. He headed to a giant tent in the center of the ghost circus. There was a mechanical fortune-teller. Terragon scratched his head. He was beginning to wonder, why must this be so difficult? He dared not question the gypsy for fear of making it angry. Homeless and unemployed for over eight months, soup kitchen guest David has been through a great deal recently. But his faith, along with support from the soup kitchen, have helped him stay hopeful and strong in the face of hardship. A trained graphic designer, David lost his job unexpectedly when his former business partner betrayed him, leaving him broke and unable to pay rent. In addition to the practical stresses of surviving on the street, David also struggled with the shame and cultural stigma attached to homelessness. During this time he still went to work reliably, but because he was unable to shower regularly and keep up with haircuts, his coworkers began to suspect he was homeless and gossiped about him. Help came one night in the form of an outreach worker who approached David in a train station and offered to help him enroll in a transitional program to find housing. But first he needed to have a statement from a social worker proving he was homeless. That’s how he first came to Holy Apostles Soup Kitchen. The social services team was “very positive and professional,” David says. The counselors helped him right away with a haircut voucher, “the first haircut I’d had in months.” They also gave him a list of other resources and services he could access nearby, and Metro Cards to travel to doctors’ appointments. David has a loyal companion in his fiancée of several years, who has stayed by his side even through his recent struggles. Today, he’s already in the second step in a transitional housing program and hopes to be placed in an apartment soon. He is determined to one day return to his art practice and go back into business again. It was Monday in Holy Week, April 9, 1990. I had been working at Holy Apostles for two years. It was a lovely early spring day and I was busy preparing the Easter bulletins. Around 4 PM the doorbell rang and someone said that they saw smoke coming from our newly installed slate roof. Workmen were up on the 28th Street side of the building working with an acetylene torch. I called down to our then Operations Manager, Scott Wing, who said he would go and check it out. There had been an earlier issue, but the workmen told Scott that they had stopped the small area that had sparked. Reassured that all would be well, and feeling a bit beleaguered from preparing materials for Holy Week services, we left the office for the evening. After I left, someone passing by the 28th Street side of the building reported in to the folks at worship: “Hey you better leave your building is on fire!” They evacuated the service and the AA meeting in the mission house and the alarms to the Fire Department were called in. The fire had reignited under the area where our organ sits today. I’ve seen picture of folks standing outside watching the flames eat away at the roof. I did not find out about the fire until about 9 PM that night on the evening news when the newscaster stated that a Chelsea Church had burned. Uh-oh, I thought. Could it be Holy Apostles? Why yes, that was the picture I saw come up on the screen. Ten minutes later our Director of Administration, Father David Norgard, called, asking staff to come in the next day. I arrived in the morning and was shocked to see a gaping hole in the side of the church. So many of the priceless stained glass windows had been damaged, including both of the rose windows. One of the windows in my office had been broken. It was cold in the office. We worked without electricity – but Con Edison was on site to get us powered back up. The Salvation Army donated some food to use to operate the soup kitchen. We got partial power to the building restored by the afternoon – enough to serve our guests. Many folks dropped by to express their condolences over the fire. One person brought us flowers. The night of the fire, someone in the Penn South Houses next door had offered to provide shelter for some of our vestments, which were rescued before the smoke or water could damage them. That afternoon, Father Bill Greenlaw corralled the staff and told us that, yes the fire was bad and we’d lost a lot, but the vestry was resolved, as were the parishioners, that we would rebuild and resume worshiping fully at Holy Apostles, as well as continue the work of the soup kitchen. By Wednesday we had full power in the building – thank you Con Edison! Four years later on Saturday, April 23, 1994, with a procession from our temporary home at the General Theological Seminary led by Bishop Grein up Ninth Avenue, the Church of the Holy Apostles returned to worship at 296 Ninth Avenue. During the restoration planning meetings it had been decided that we would redesign the interior without reinstalling the church pews to create a more flexible worship space and a dining room for our soup kitchen guests. The soup kitchen began using its glorious new dining room in May of 1994. We also had a lovely reception in late May for the fire fighters who helped to save our building. Raymond Clagnan (formerly of Rambusch Studios – an eminent stained glass studio) came to work for Holy Apostles during our restoration. His workshop was located in the choir loft. Ray, Nancy Howell, Bruce Gutelius and one intern, Dana Legg, were tasked with putting together the jigsaw puzzle of glass shards left after the fire. They did an exemplary job of restoring the many church windows, matching stained glass in some of the shards tiny indeed. They also fashioned the windows in our narthex – one of the best recycling projects ever, using all of the pieces that could not be fitted into the restored windows to create the new ones. Ray’s father, Bruno Clagnan, came by to visit his son and our in-house “glass shop” and liked the work we were doing for the hungry guests who come to our door every weekday. Bruno was also a stained-glass designer and gifted us with an original design, honoring not only the work of the soup kitchen, but also the craftsmen and women who helped to restore our fire-damaged church. The window was installed shortly after the restoration was complete and opened as the dining space for our guests. You’ll notice that there is no end date on the stained glass – that is because we continue to serve today, and have only ceased operation in the event of a shelter order from the city of New York. Anthony was eventually taken away from his parents and lived in various group homes and with different foster care families. Having no family or stable living situation, he turned to drug use to cope with his sadness, confusion and fear. By the time he was 18 he had become homeless, living on the streets of Midtown, and was addicted to drugs. “I was bouncing back and forth between detox, using drugs, and sleeping on the streets,” he recalls. It was during this time that he first found Holy Apostles Soup Kitchen, and started visiting every day to eat. Though he wasn’t yet ready to accept the help that he needed, those meals helped keep him alive until he could find the strength to make a change. Sadly, it would take a long time before Anthony would make a full recovery. Just as he left the foster care system, and now an adult, he spiraled even further, ending up in prison for 15 years. By that point Anthony had become a father himself, but he had no contact with his children. After completing his sentence he was released with no support system in place, he quickly returned to homelessness and drug use. “I had enough money to buy drugs that night, but I just couldn’t bring myself to do it,” he remembers. He had always refused help from homeless outreach workers, preferring to stay on the street and continue to use drugs, but that night, when their van pulled up and they offered to take him to shelter, he got in. “It was 6 degrees below zero when they picked me up,” he says. “I had no shoes. I hadn’t showered in five months. I was embarrassed.” When he got to the shelter he was greeted at the front door and offered something to eat. He told them all he wanted was to take a shower. That long, hot shower was Anthony’s first step toward accepting help and turning his life around. He went through detox and stayed clean this time, then moved on to get his own apartment in a supportive housing unit, which he shares with his two dogs that once lived with him on the streets. Now he is even reunited with his children, after many years with no contact. Today, the soup kitchen is a place where Anthony can find a meal, but it’s also more than that. “God knows I’m grateful,” he says. “I come here to stay grateful.” After years of homelessness and time spent in prison, the soup kitchen is a reminder of how far he’s come, and that there is some stability in the world, a place that didn’t give up him, where he can find community and kindness.